Suits classic Smiths, Jaeger & all other gauges taking the standard E10 screw bulb. The solution to poorly lit classic car gauges. Struggling to read your gauges or warning lamps at night? These LED bulbs are a simple, quick, direct and brighter replacement for older style standard GLB987 / LLB987 / C15788 / E10 bulbs, suits all vehicles taking the standard screw in bulb. Have the additional benefit of reducing your power consumption to a much lower level which may benefit older/tired dash wiring. 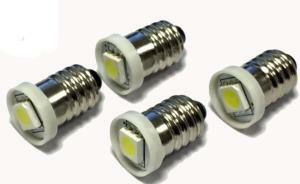 12V 0.5 W 3000K 48 Lumen 8 SMD LED Warm White bulbs. They will work with vehicles fitted with 12v or dual 6v batteries, negative earth. Will not suit positive earth vehicles. These bulbs are just 18 mm in length so will fit easier than the 5 SMD bulbs (30mm) where the holder requires a shorter bulb. These bulbs typically last over 30,000 hours and are vibration proof. Warm white as per original glass versions. LED Vehicle Bulb 1156 P21W Single "Filament"
Our LED bulbs are a straight swap for standard filament bulbs. Doubtless you are already aware of the benefits of LED lighting, but if not a Google search will tell you all you need to know. If you have a bulb that looks similar to the below then you can replace it with our LED equivilents. 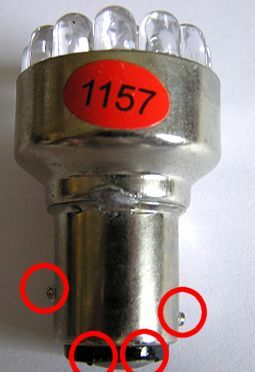 Bulb number 1156 is commonly used for bayonet single filament bulbs on vehicles with separate brake and tail lights - identified by two opposing pins at the same height on either side and one contact on base. Please click pic to observe. Available in white, orange or red - you should replace a bulb with the same colour as the bulb that was removed (usually white) eg if you remove a white bulb from behind an orange indicator lens then you must replace it with a white led bulb, not with an orange one. Note that these bulbs are slightly brighter than standard - they are not so bright as to cause your vehicle to fail an MoT test. Note these bulbs are slightly wider at 26mm than a standard bulb which is 23mm, they are standard length. 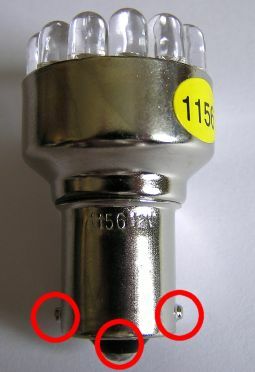 LED Vehicle Bulb 1157 P21W Twin "Filament"
Bulb number 1157 is commonly used for bayonet twn filament bulbs on vehicles with combined brake and tail lights - identified by two offset opposing pins positioned either side of body and two contacts on base. Please click pic to observe. Simply replaces your original bulb. Convert your standard bulbs to Halogen - 250% brighter. Very useful to turn reversing lights into a bright beam or upgrade sidelights. 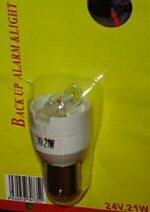 If you have a bulb that looks like the below then you can replace it with this halogen.